A deliciously rich Chocolate Sour Cream Bundt Cake covered in a creamy two-ingredient chocolate ganache. With a rich, velvety texture, this is hands-down my favourite chocolate cake recipe. Sometimes life calls for chocolate cake. Especially when it’s dripping with dark chocolate ganache. 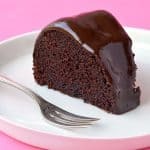 This Chocolate Sour Cream Bundt Cake is one of those amazing homemade desserts that everyone will just love. 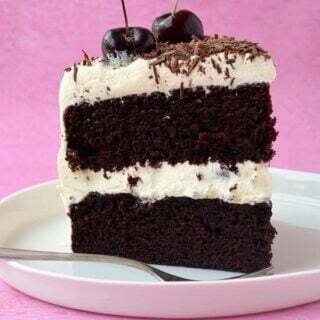 The chocolate cake has a velvety texture and the addition of sour cream adds lovely depth of flavour. Simple, sweet and perfect for chocoholics like you and me. I’ll be honest with you. 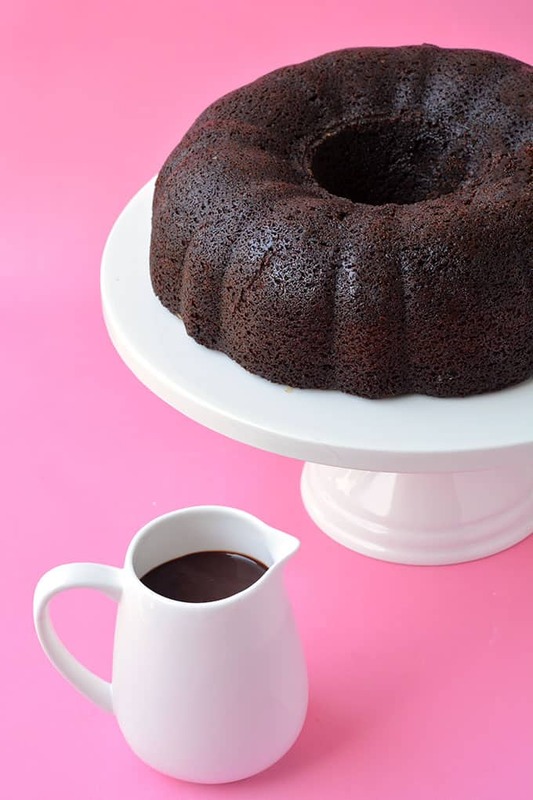 This Chocolate Sour Cream Bundt Cake is my go-to cake. Any dinner party, birthday or celebration, this is the cake I’ll take. Not only is it beautiful, it’s a total crowdpleaser. I mean, who doesn’t love a big slice of chocolate cake? Especially when its coated with creamy chocolate ganache. That’s the other reason why I love it. 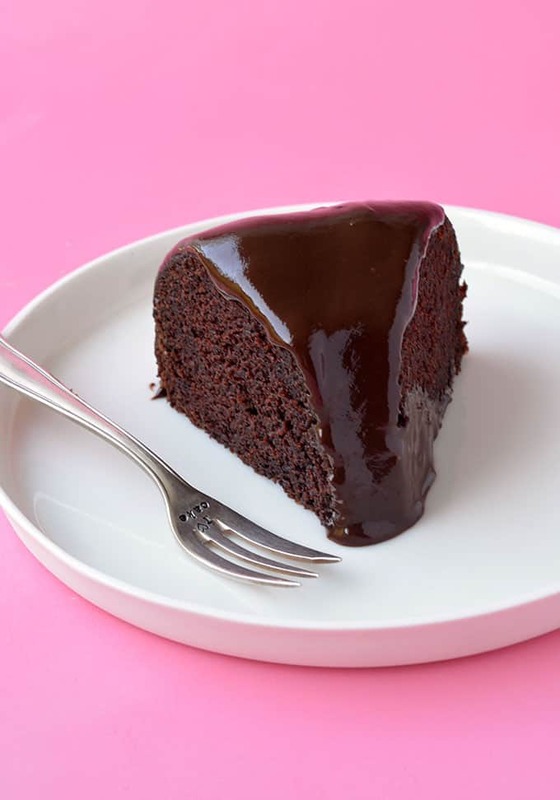 Instead of whipping up a big bowl of frosting, all you need to do is make a two-ingredient chocolate ganache – one that pairs perfectly with the moist cocoa-laden cake. Have you ever made chocolate ganache before? You are going to love it. I use it all the time to make drips on my layer cakes or to make the perfect Chocolate Tart or creamy Chocolate Truffles. It tastes amazing and is extremely versatile when it comes to desserts. So, all you need to do it chop your chocolate by hand – yes, you can use milk, white or dark chocolate. I prefer dark chocolate as it is just sweet enough. 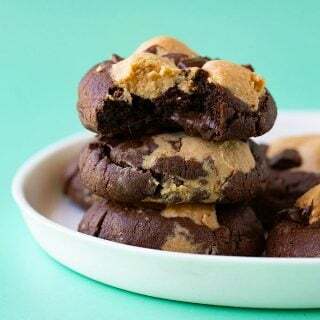 You can also use chocolate chips. Then pour over hot cream. You can warm your cream in the microwave or on the stovetop. You don’t want to boil it, you just want it hot to the touch. Leave your ganache to sit for approximately 5 minutes, before whisking until smooth. Voila! Two ingredient chocolate ganache. The ratio of chocolate to cream will vary, depending on what you are using it for. A little less cream, will make a thicker ganache, while more cream, a drippy ganache. Your ganache will firm up over time and should be stored in the fridge, if you’re not using it straight away. It never lasts long in my house. Have you ever had your cake stick to your bundt pan? It can be so disappointing after all your hard work. To prevent your cake from sticking, I recommend taking the time to greasing your bundt pan really well with butter. Use a paper towel to smear butter all over your bundt pan – getting into every single nook and cranny. Double check that you’ve covered every single inch, from the top to the bottom – especially around the middle panel. 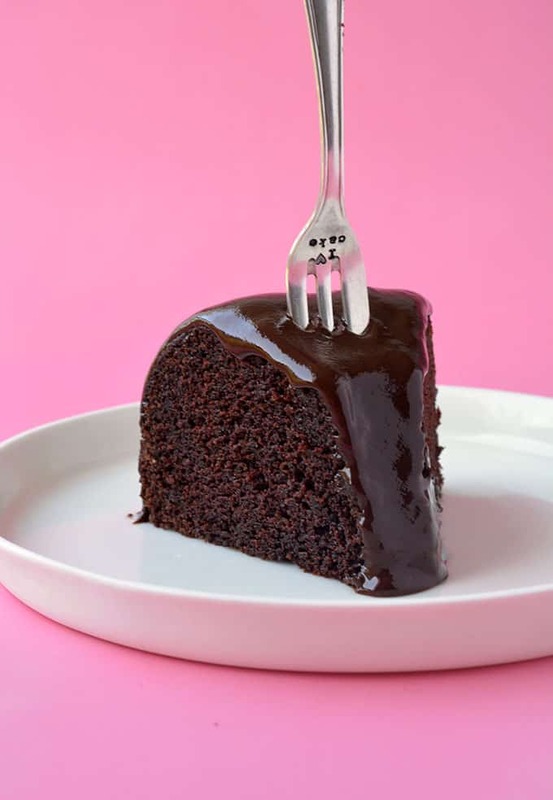 When it comes to removing your cake, leave it to cool for 10-15 minutes, then gently run a butter knife around the edges to loosen the cake, and in the middle. Place a plate over the top of your bundt pan, then flip over the plate and pan in one swift movement. Your cake should come out in once piece. If it doesn’t – don’t worry. We’ve all been there – it’ll still taste amazing. 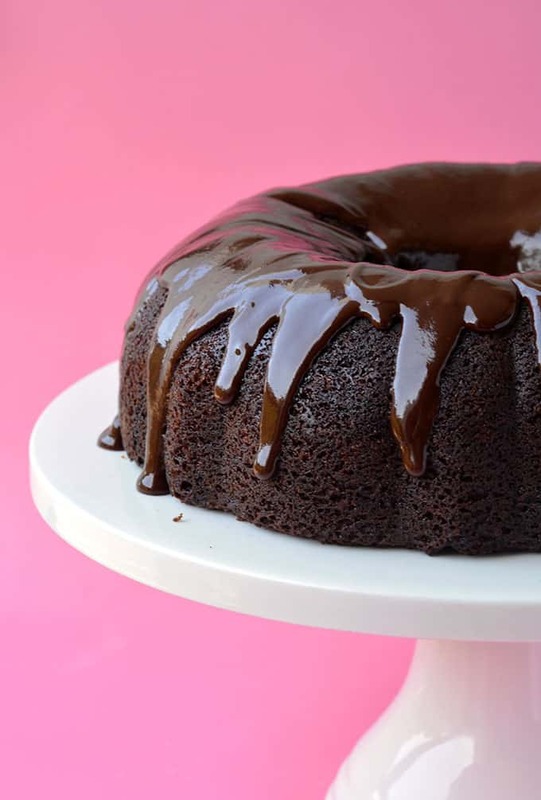 Moist and tender Chocolate Sour Cream Bundt Cake dripping with dark chocolate ganache. Grease your bundt cake tin really well with butter. Preheat the oven to 180 C (360 F). In a large mixing bowl, add butter and sugars and beat with an electric mixer until pale and creamy. Add vanilla and eggs, one at a time, and continue to beat until mixture is combined and creamy. Boil the kettle and pour out 1/2 cup water and set aside. In a separate bowl, sift plain flour, cocoa powder, baking powder and baking soda and lightly whisk. Add dry ingredients to the wet, along with the hot water and gently fold with a spatula. Finally, add the sour cream and fold until the mixture is completely combined and smooth. It will be quite thick – this is fine. 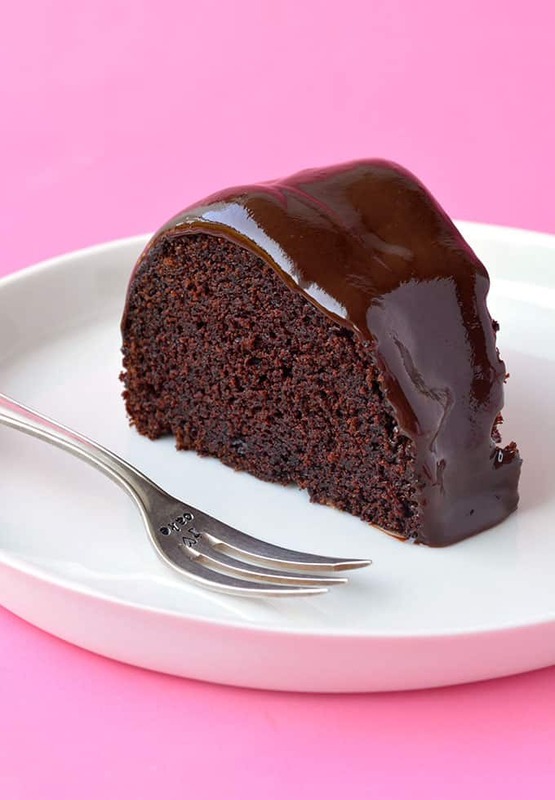 Pour chocolate batter into prepared bundt pan and bake for approximately 40 minutes or until a skewer inserted into the middle of the cake comes out clean. Leave the cake to cool for about 15 minutes before carefully transferring to a wire rack to cool completely. To make chocolate ganache, chop dark chocolate and transfer to a bowl. In a small saucepan, add your cream and pop on a medium heat. Once the cream is warm but not boiling, pour the cream over the chocolate and leave for 2-3 minutes. Gently whisk the mixture until smooth. Leave to stand for a few minutes and it will thicken slightly. Then pour chocolate ganache over the top of your cake. This looks absolutely delicious! Do you know the baking time for a half sheet pan as well as 8 or 9 inch layers? Thank you. Hi Cheryl, it really depends how deep the batter will be, but I recommend checking from about the 25 or 30 minute mark, and then checking every 5 minutes from there by inserting a skewer into the middle. Hope that helps! Hi Elsa, it sure can! My suggestion would be splitting it between two 8-inch size cake pans. You could have to adjust the cooking tome accordingly as the cake will cook much faster. Hope that helps! Oh mY gOodnes!!! Ok well It took me three times to master this recipee. But the fails were my fault. But that third time! It was delicious! Picture perfect…moist beautiful. I made the flops into cake pops and they were crazy good too!! Absolutely amazing!!! Aww good on you for persevering Rachel! I’m so glad you enjoyed the cake – and making less-than-perfect cake into cake pops is a great idea ☺️ Thank you for trying one of my recipes! After seeing the picture of this cake on Instagram, I saved the post because it looked sooooo good! I made this yesterday for my dad’s birthday – using cake and pastry flour because I was completely out of ap flour – and it was AMAZING! Easy to make AND tastes incredible? Yes and yes! This will now be my go to chocolate cake recipe for every occasion! This is the best cake! My family always thinks it’s time for chocolate cake. Your Bundt cake looks moist and delectable—and your glaze make it even more irresistible!! This looks amazing! Stunning photos, of course, and I agree that sometimes simplicity is key, especially when it comes to chocolate 🙂 Pinning! Thanks Medha! I totally agree, chocolate is just too good by itself! Hi Sally, fantastic! Thanks for stopping by! I couldn’t agree more, I think this is my favourite cake ever! I love any cake with sour cream in it, the texture is just sublime! This one had me drooling! Totally Sammy, isn’t it great! Thanks for stopping by! I recently made a sour cream chocolate cake too!!! isn’t it heavenly?! yours looks fabulous!!!!! GORGEOUS! This looks incredible! I’d hate to have to make this a couple times…. 😉 Pinned! I love using sour cream in cakes, and this looks and sounds delicious! This cake looks perfect, Jessica! I’m totally swooning over that chocolate ganache! Just gorgeous and perfect for satisfying any chocolate craving! So much chocolate ganache! Thanks Kelly! This looks delicious, just like everything you make! I have been on a quest for the perfect chocolate cake, and I just may have found it! Aw thanks so much Melissa! Let me know if you try it! This sounds so good. 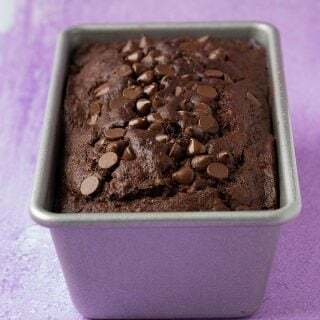 No need for cookie dough and peanut butter when you have a delicious chocolate cake! Simplicity at its best. 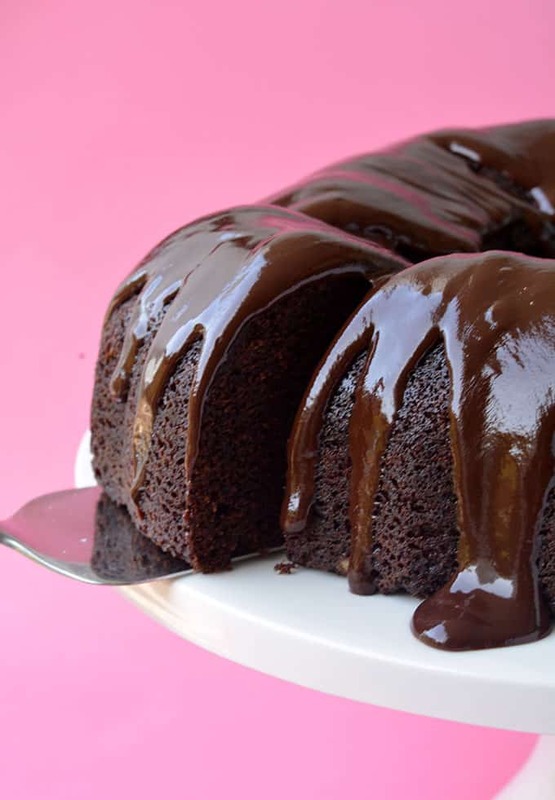 This cake looks so moist and perfect! When I dream tonight it will be of this cake! Gorgeous photos and a gorgeous recipe!!! Sour cream cakes are so delicious! Thanks Lucy! Tell me, I couldn’t stop eating it! That is one perfect cake! It looks so rich and chocolatey, and I love the ganache!!! One of those beautiful, timeless classics done very well. It looks gorgeous! Great minds seriously think alike, because I have a Chocolate Cake recipe up on my blog today, too! 🙂 Yours looks divine – can’t beat scratch-made chocolate cakes! YAY for chocolate cake! Your right, sometimes it is the only answer. Thanks for stopping by Hayley! I’m always ready for chocolate cake! I like big bundts and I cannot lie! I cannot deny…this one looks especially scrumptious. Any baked good with sour cream is like catnip to me. That is one the most photogenic chocolate cakes I have ever seen! I am in love. I have a similar recipe with yoghurt but need to give sour cream a go too, obviously! That is so kind, thank you so much! Oh yes, I imagine its very similar with yogurt, perhaps I should try that and see if I can taste the difference. Thanks for stopping by! Oh my, your cake is driving me crazy, Jessica…! I find sour cream batters to be richer and have a better flavor than other cakes so you’ve had me at saying "Sour cream bundt cake". 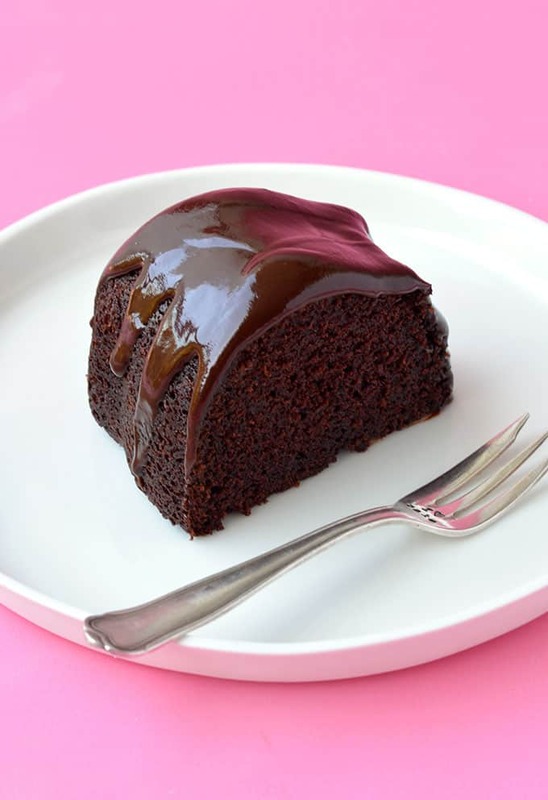 Then I clicked the recipe and saw all these great pictures and that chocolate drizzling… oh my! Well done! I think you are right Oana! Sour Cream Chocolate Cakes are now my favourite too. Thank you so much for stopping by. Craving a slice now.. it’s safe to say my chocolate cravings have definitely kicked in after seeing these drizzle shots!